What Sir Arthur said many years ago is certainly true today. So many wonderful ideas come from younger generations of scientists, marketers, writers, etc., that we sometimes forget to open our minds to new ideas and ways of thinking. This was certainly the case in Australia. As an undergraduate student in astrophysics at Sydney University, Cleo Loi came up with an idea for using radio telescopes to “see” something noone has ever been able to visualize. A Sydney University student has for the first time used radio telescopes like a giant pair of electronic eyes to locate huge plasma tubes in the atmosphere that interfere with astronomy observations and which could affect some civilian and military navigation systems. Scientists have long thought that the interaction of the earth’s magnetic field with energy from the sun would create huge tubes of plasma. But they have never been able to directly observe them over large scales or determine their shape. Until now. While still an undergraduate, Cleo Loi, 23, used the Murchison Wide Field Array in the Western Australia desert in a way that no other radio telescope has been used before. 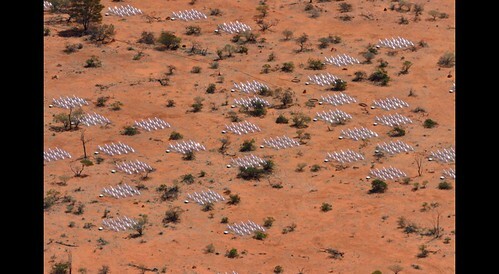 The wide field array consists of 128 antenna “tiles” over a seven-square-kilometre area. Ms Loi divided the array’s tiles into two halves using the western half like a right eye and the eastern half like a left eye. Similar to the way humans use sight, she used triangulation to build a three-dimensional dynamic map of the plasma tubes over a large area. Ms Loi, who graduated in March, had to overcome the initial scepticism of senior colleagues who thought her observations were too good to be true. Her undergraduate supervisor, Dr Tara Murphy, said: “It is to Cleo’s great credit that she not only discovered this but also convinced the rest of the scientific community. As an undergraduate student with no prior background in this, that is an impressive achievement. The tubes are in the earth’s upper atmosphere, known as the ionosphere, which largely consists of ionised oxygen. The ionosphere is so called because photons from the sun dislodge electrons from otherwise neutral atoms in this layer of the atmosphere, creating a soup or plasma of electronically charged particles. This plasma interacts with the earth’s magnetic field, creating field-aligned ducts of the plasma. The free electrons also interfere with astronomers’ observations and can potentially affect satellite navigation systems. We first noticed Yves Rossy in 2007, then a year later over Switzerland. Earlier this week, he published a beautiful video over Dubai (shot in 4K). Amazing footage of a fantastic experience: strapped to a jetpack, flying! Can you believe how much desert there is in the Arabian peninsula? Dude. 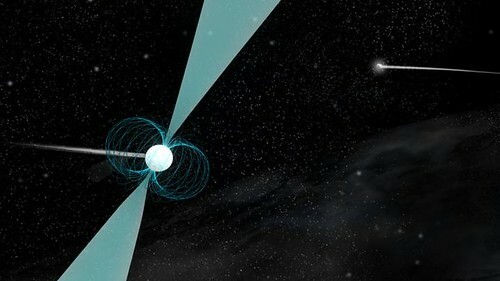 DNS in this case stands for “double neutron star” and a pulsar in the widest known orbit around another neutron star was discovered by two high school students. In the summer of 2012, during a Pulsar Search Collaboratory workshop, two high-school students discovered J1930−1852, a pulsar in a double neutron star (DNS) system. Most DNS systems are characterized by short orbital periods, rapid spin periods and eccentric orbits. 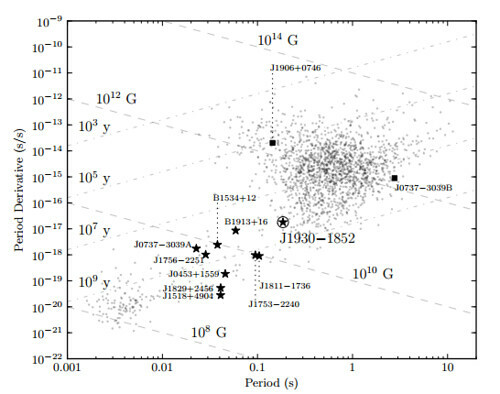 However, J1930−1852 has the longest spin period (Pspin∼185 ms) and orbital period (Pb∼45 days) yet measured among known, recycled pulsars in DNS systems, implying a shorter than average and/or inefficient recycling period before its companion went supernova. We measure the relativistic advance of periastron for J1930−1852, ω˙=0.00078(4) deg/yr, which implies a total mass (Mtot=2.59(4) M⊙) consistent with other DNS systems. The 2σ constraints on Mtot place limits on the pulsar and companion masses (mp1.30 M⊙ respectively). J1930−1852’s spin and orbital parameters challenge current DNS population models and make J1930−1852 an important system for further investigation. A P–P˙ diagram showing all pulsars in DNS systems (stars/squares) and all other known pulsars (dots). Measured P and P˙ come from the ATNF Pulsar Catalog (Hobbs et al. 2004) and lines of characteristic age and surface magnetic field are shown with dot-dash and dashed lines, respectively. Recycled DNS pulsars (stars) appear between the normal and millisecond pulsar populations and are listed in Table 2. Despite its significantly longer spin period, J1930−1852 clearly belongs in the population of recycled DNS pulsars, unlike J1906+0746 and J0737−3039B (squares) – neither of which have undergone recycling. With so many astronomers engaged in this type of work, it’s inspirational to find younger ones with no inhibitions and lots of hope continues to reap the rewards of discovery. 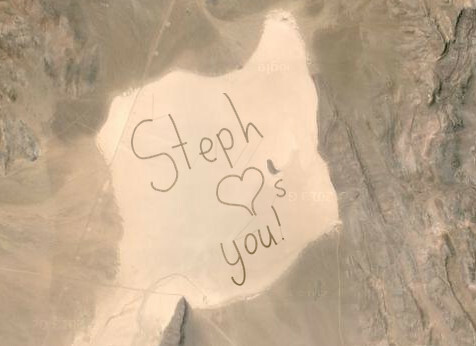 An astronaut’s daughter sends her father a message — physically, in writing — while he’s orbiting in the ISS. It’s emotional, social and very cool. Good marketing on Hyundai’s part, too. Hyundai made a little girl’s wish come true for the whole world to see. A team of eleven Genesis cars united to create “the largest tire track image” on the Delamar Dry Lake in the Nevada desert, United States. (Image size : 5.55 sq. km.) This extraordinary message has made it to the Guinness World Records® 2015. I hope they sell a bunch of cars to rocket scientists! OK, we’ve all heard that “hindsight” is always 20/20. Knowing the past can predict the future. Now we’re learning that knowing the future can predict the past. If this proves true in our ‘classical’ world, it would mean that what we’re doing now has been influenced by the decision made by a future version of us. This all remains theory, but physicists have created devices that has allowed them to measure these fragile quantum systems to see if this really is the case in the quantum world. 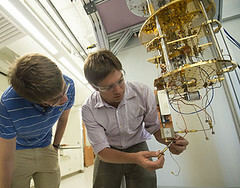 Professor Kater Murch at Washington University used this technique to look at the quantum state of two particles at different stages in their evolution. The quantum state was detected by putting a circuit inside a microwave box. A few microwave photons – or particles of light – were sent into the box, where their quantum fields interacted with the circuit. When the photons exited the box they had information about the quantum system. ‘We start each run by putting the qubit in a superposition of the two states,’ Professor Murch said. They then try to guess the hidden result, which is their version of the missing page of the murder mystery. ‘Calculating forward, the probability of finding the system in a particular state, your odds of guessing right are only 50-50,’ Murch said. ‘But you can also calculate backward using something called an effect matrix. Just take all the equations and flip them around. They still work and you can just run the trajectory backward. 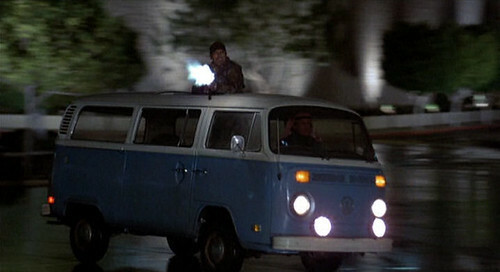 The shattering thing about the retrodiction is that it is 90 per cent accurate. When the physicists check it against the stored measurement of the system’s earlier state it is right nine times out of 10. This suggests that in the quantum world time runs both backward and forward whereas in the classical world it only runs forward. Professor Murch told Dailymail.com that it’s as if you left your keys somewhere in the house, but couldn’t remember where. In the quantum world, they could exist in every room of the house simultaneously. When you eventually find them in the kitchen, in the classical world it is clear that they were there all along, in the quantum world the uncertainty is intrinsic, but Profesor Murch was able to show that indeed hindsight can be applied to make a better guess about where they were in the past. In the same way, the improved odds in the current experiment imply the measured quantum state somehow incorporates information from the future as well as the past. And that might implies that time, notoriously an arrow in the classical world, is a double-headed arrow in the quantum world. ‘It’s not clear why in the real world, the world made up of many particles, time only goes forward and entropy always increases,’ Professor Murch added. ‘But many people are working on that problem and I expect it will be solved in a few years,’ he said. 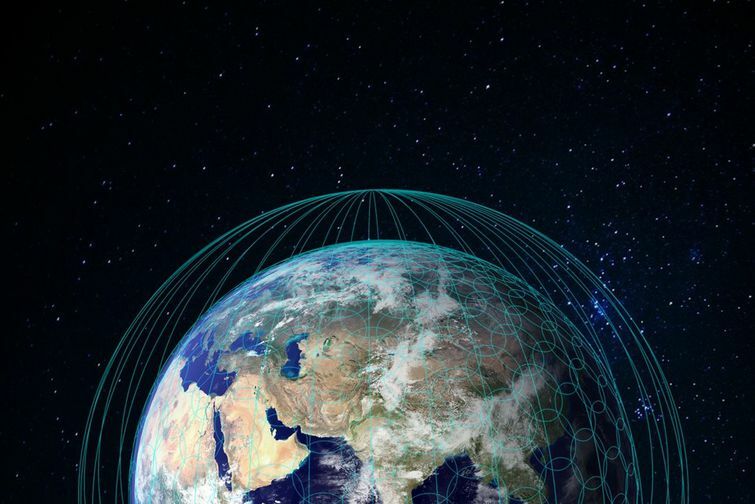 SpaceX, working with Google, and OneWeb, teamed with Virgin Galactic, race to build satellite internet. Read entire News Bits issue here. 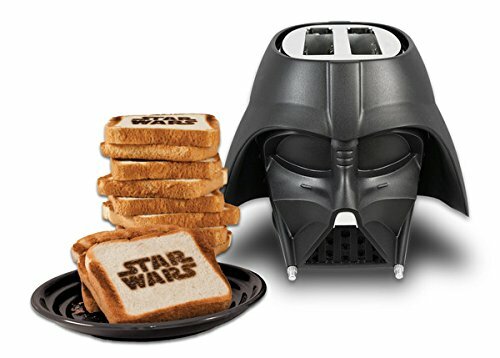 There is no shortage of Darth Vader things on Amazon. Or Star Wars theme weddings. Since viewing this video in 2007, I’ve appreciated the band’s music more. Especially this one: the Celebration of 750th anniversary in Lviv, Ukraine on September 30, 2006, with a light show by Gert Hof, centered around the Lviv Opera House.